State Government would make a request to the Chief Minister of Haryana Bhupinder Singh Hooda and others in the North Indian States where Gutka and other chewable tobacco products were being manufactured to close down the manufacturing of these products in their respective States so that it helps in discouraging the use of it and save people from dreaded diseases like cancer. This was stated by Prem Kumar Dhumal, Chief Minister while addressing media persons after he paid tributes to the Father of the Nation and former Prime Minister late Lal Bahadur Shastri on their birth Anniversary here today. Chief Minister said that the ban on consumption of Gutka and other chewable tobacco products was enforced all over the State from today onwards and any trader selling such products would be liable to be booked under the legal provisions made for strict implementation of the ban. He said that the decision had been taken keeping in view the health of the people of the State and protect them from falling prey to various diseases which included cancer as well. He said that he was confident that the commonman of the State would overwhelming support the move and implement the ban in letter and spirit. 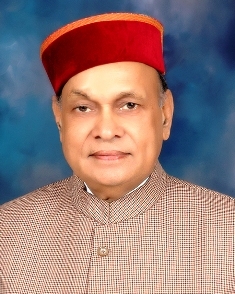 Prof. Dhumal said that the State had succeeded in banning use of plastic carry bags with the pro-active support of the commonman which had been a major reason for degradation of the environment in the State. He said that after the ban came into force people had voluntarily shifted to other alternate carry bags of cloth and jute material which were environment friendly and more convenient for use. He said that the State Government had always been endeavouring to muster the support of commonman before putting on restriction on the use of such non-biodegradable products. He said that the people of the State had always been supporting such move of the Government and hoped that the ban on Gutkha etc. would also be implemented with the public support and safe people, especially the youth, from various health hazards. Suresh Bhardwaj, Sohan Lal, MLAs, Sanjay Chauhan, Mayor, Tikender Panwar, Deputy Mayor, Municipal Corporation, Shimla, Dr.Arun Kumar, Deputy Commissioner, R.S. Gupta, Principal Private Secretary to the Chief Minister and Chander Shekhar Pandit, S.P., other senior officers and prominent people were also present on the occasion. Later, Chief Minister also enjoyed a cup of coffee at Indian Coffee House with the people who were sitting in the Coffee House and belonged to different parts of the country. Bhartiya janta Yuva Morcha Chandigarh organised Programme "Atulya Atal"